The D7 series pushbuttons are come in two different types to meet each application. Both operators are designed for harsh environments and deliver a high performance. The D7P operator is a black plastic with a captive bezel and are constructed with high-grade thermoplastics that allow for the device to with stand harsh environments. The D7M operator is designed for more tough applications. The D7M is die-cast metal with a shiny metal captive bezel, and has a chrome plated finish. These devices are made easy for installation and offers an anti-rotation tab which keeps the front elements from turning or falling off the control panel. A central mounting ring is also applied for quick installation and removal. All back-of-panel components including contact blocks and power module elements snap-on and are accessible and interchangeable without removing pilot device from the panel. The D7 series indicating lights are available in plastic or metal with a diffuser style lens and a metal or plastic mounting latch. Lens color are available in, amber, green, red, yellow, blue or clear. 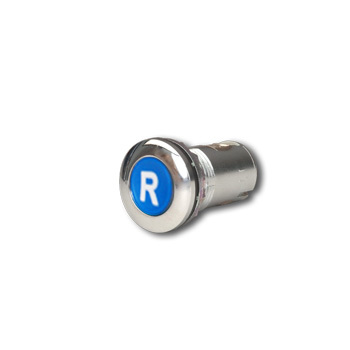 The D7 series reset operators are available in plastic or metal with “R” for reset and come in white, black or blue. Rod lengths vary from, 1.57” to 12.85”.